Located close to Hunter Street, Newcastle, N.S.W. 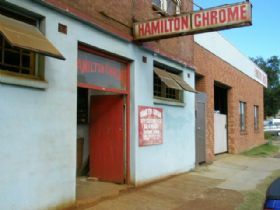 Hamiliton Chrome is an old school chroming shop producing the highest quality rechroming service for all makes and models of classic cars. We have the equipment and expertise to revitalise your chrome bumpers, trim, fittings and mouldings. Free quotes are available and we can provide a timeframe for completion allowing you to manage your project milestones. The staff are dedicated to producing the highest quality workmanship to ensure your brightwork stands out on your classic car.